The compact M-Audio Axiom 25 II mobile controller combines all the production power and performance you need to get the most from your music software and MIDI gear. More than just a "data entry" controller, the Axiom 25 features piano-style, semi-weighted keys for a musically satisfying playing experience--yet it's small enough to fit in a backpack. The M-Audio Axiom 49 controller combines all the production power and performance you need to get the most from your music software and MIDI gear. More than just a "data entry" controller, the Axiom 49 features piano-style, semi-weighted keys for a musically satisfying playing experience. Large dynamic trigger pads make it easy to program beats and trigger one-shot samples--while the encoder knobs, faders, and buttons deliver complete real-time control over your software. DirectLink mode provides easy, automatic access to common DAW functions* including transport, mixer, track pan, and virtual instrument parameters--no complicated setup required. Axiom 49 even features a sleek, angled top panel for easy viewing in any environment. The M-Audio Axiom 61 controller combines all the production power and performance you need to get the most from your music software and MIDI gear. More than just a "data entry" controller, the Axiom 61 features piano-style, semi-weighted keys for a musically satisfying playing experience. Large dynamic trigger pads make it easy to program beats and trigger one-shot samples--while the encoder knobs, faders, and buttons deliver complete real-time control over your software. DirectLink mode provides easy, automatic access to common DAW functions* including transport, mixer, track pan, and virtual instrument parameters--no complicated setup required. Axiom 61 even features a sleek, angled top panel for easy viewing in any environment. The M-Audio Axiom Pro 25 keyboard controller builds on the acclaimed Axiom 25, delivering premium TruTouch( action, proprietary HyperControl(TM) MIDI mapping technology and other cutting-edge enhancements in a compact model perfect for tight spaces. HyperControl automatically maps the keyboard's 28 controls to commonly accessed parameters in digital audio workstations including Pro Tools, Cubase, Logic and Reason, as well as software instruments. 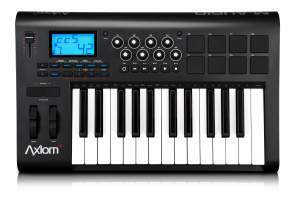 The M-Audio Axiom Pro 49 keyboard controller builds on the acclaimed Axiom 49 with premium TruTouch action, proprietary HyperControl MIDI mapping technology and other cutting-edge enhancements. HyperControl automatically maps the keyboard's 65 controls to commonly accessed parameters in digital audio workstations including Pro Tools, Cubase, Logic and Reason, as well as software instruments. 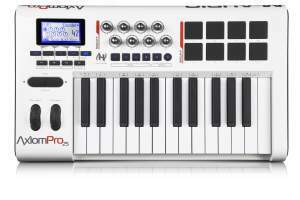 The M-Audio Axiom Pro 61 keyboard controller builds on the acclaimed Axiom 61 with premium TruTouch action, proprietary HyperControl MIDI mapping technology and other cutting-edge enhancements. HyperControl automatically maps the keyboard's 65 controls to commonly accessed parameters in digital audio workstations including Pro Tools, Cubase, Logic and Reason*, as well as software instruments.